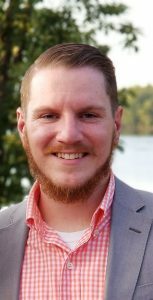 Andrew Miller is a third year Ph.D. student in the Department of Mathematics as well as a GCCI student. In addition, Andrew is an Adjunct Professor at Rhode Island College in their Mathematics Department. His research interests lie in the Numerical Analysis on Partial Differential Equations, specifically using the Finite Element Method. To overcome this difficulty, an instructor can use questioning as a strategy to stimulate a conversation about a topic being covered on any given day. Before we get into how academic conversation can be created, you may be asking yourself, “why do I want a conversation in my class?” or, “how can I afford to have a conversation when I have so much content to go through?”. Valid as these questions are, every instructor should desire to have content oriented dialogue between students and the instructor. Think back to when you were in graduate school. Was there ever a story or challenging problem that sparked some disagreement between you and your peers? In that back and forth conversation, consider how much you learned about that particular topic! Wouldn’t you want that engagement for your own students? The process of explaining one’s views requires active participation and engagement in the learning process and prompts critical thinking (Chiu and Chi, 2014). 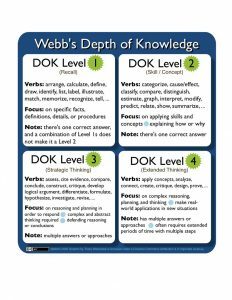 Taking a moment to think about the DOK levels and their implications, levels 1-3 are the most appropriate for questioning during lectures. Level four is most appropriate for test questions, projects, and other assessments that require time to construct thoughtful answers. Ask students to recall what was covered in the previous class. What are the steps to solve a proportion problem? How can the steps of a solving a proportion problem be applied to solving a percent increase problem? How did the researchers apply the scientific method to their experiment? How did the Revolutionary War affect the vote of the first president of the United States? Ask students to discuss the role of racism in the movie Pocahontas from the creators’ perspective. Ask students in a foreign language class to discuss how the translator of a book can change the author’s voice. I will use the first example as a basis for how we can start the conversation. A hypothesis test in general is a statistical test where students will take data from a sample and test a hypothesized claim. Once students complete the test they need to analyze the information and discuss whether they would support the claim or not support the claim. To begin, do not make any comments on the student work. Ask students to pair up with a partner to discuss why the solution is correct or to discuss why something is wrong and try to fix it (an example of a DOK 3 question). After a short time ask the class, “What do you think about that?” or “Why do you think this answer is correct?”. Always give the class at least thirty seconds to think, even if students have begun to raise their hands . This will allow all students in the class the opportunity to think deeply about the question. Then ask for a show of hands of those who agree and disagree. Here is the part where you can get students to communicate between themselves rather than just respond to you. Ask a student who agrees or disagrees why they do. Once they are done, ask a student who thought the opposite to challenge what the other student thought. You can help to moderate the discussion by asking students to expand on their reasoning and respond to each other. Overall, we want to ask open-ended questions that allow for critical or deep thinking about the material being covered. Then we can continue the conversation by asking open-ended follow up questions answered by the students. You will act as a conversation guide rather than being the conversation. Of course, always be on the lookout for misconceptions, bad advice, or teachable moments and interject your expertise when necessary. As college and university instructors and faculty we strive for our students to gain a deeper understanding of course material as well as develop critical thinking skills. As we have seen, classroom dialogue is one way to achieve these goals. Students who actively communicate with each other and the instructor are likely to show greater depth of knowledge and better overall performance in the course. Thus we should desire to implement some changes to our course dialogue. Use low level questions in the DOK 1-2 range in order to get your students comfortable responding to questions. Consistently encourage students to ask their own questions as well as respond to other students questions. Do this from day one! Once you feel as though your class is ready, it is time to spark the conversation with some DOK 3 questions. This will be best be done if a little thought is put into the question ahead time. Give students some time to think about it before calling on a student to respond. Open up the floor for a student response and then ask other students to comment. Incorporate other student’s opinions by asking for different perspectives or asking students to summarize what a student has said. Continue to facilitate the conversation by asking students open ended questions beyond the DOK 1 level. Once students are comfortable with this type of classroom dialogue it will be very easy to accomplish going forward. Chiu, J., Chi, M.T.H. (2014). Supporting self-explanation in the classroom. In V.A. Benassi, C.E. Overson, & C.M. Hakala (Eds. ), Applying science of learning in education: Infusing psychological science into the curriculum. (pp. 91-103). This entry was posted in Blog and tagged active learning, critical thinking, dialogue, discussion. Register for Spring 2019 Seminars in College Instruction!